Robert Downey Jr. Click here to play! Samuel L. Jackson. Who needs 'em? Iron Man is out to make his mark and he has plenty of cash to share around with his friends. Will you join the mighty superhero in his quest for justice; superior riches await if you accept! 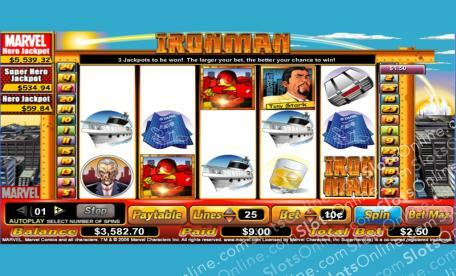 Iron Man is an enticing 5-reel slot that is played across 25 manic pay lines. The more pay lines you activate will ultimately earn you more cash on winning hands, as each line multiplies the payout odds. The Iron Man logo is Scattered and will award you up to 100 times your initial wager; spin up three of them in one go and you will be rewarded with a Bonus Round where there is plenty of cash to be won. The Substitute is Iron Man himself, and he can not only become any other symbol on the reels besides Scattered logos, but he can also payout up to 6000 times your initial wager. Iron Man is waiting for your answer; join today! The Iron Man logo is Scattered and will payout up to 100 times your initial wager, as well as send you to the Bonus Round when three or more show up. Iron Man is Wild and can pay up to 6000:1 on winning combos, as well as substitute for any other symbol except Scatters. The Bonus Round in Iron Man can be found when you spin up three or more Scattered Logos. Inside, you there is plenty of cash to be won.